The potential benefits of chiropractic health care are nearly impossible to number. If you have been in a car accident and suffer from severe lower back pain as a result, or if you have discovered that you have headaches caused by nerve conduction issues, there is very likely a chiropractic form of treatment that can help alleviate your discomfort and add quality to your life. The staff of Caron Chiropractic is capable of helping you understand your specific issues and the best strategies for responding to them. With an office in St. Paul, and a staff of highly trained professional practitioners, Caron Chiropractic can provide relief for the physical maladies that are disrupting your life, whether they are severe or just annoying. So, back to the classic example of the car accident that causes severe lower back pain for a moment. When our bodies suffer a trauma such as a severe car accident, what we actually experience is a cascading effect of trauma, which can manifest as an injury to one obvious part of our anatomy, but which originates in another part of the body entirely. If you have had the bad fortune of being in a car accident, and that accident was severe enough, you most likely felt a kind of domino effect of trauma. Often, it is the lower back that takes the brunt of such accidents, which is why it is such a classic example of chiropractic care. The staff at Caron Chiropractic are able to treat the symptoms of the pain caused by that kind of trauma, but they are also able to identify and treat the points of origin of the pain, even though that pain may originate in a different part of the body. 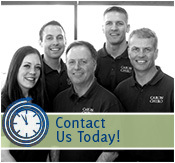 Which brings us to the more nuanced aspects of care from Caron Chiropractic. In addition to the more familiar approaches to chiropractic care (the controlled movement of limbs and spinal adjustment to alleviate pain), the staff of Caron Chiropractic can also provide such services as acupuncture—the use of extremely fine needles applied to pressure points, which can improve overall health, and even reduce symptoms of asthma. Caron Chiropractic works to remain on the cutting edge of chiropractic health care, and offers the techniques for pain relief that work best for your specific symptoms. Whether you will benefit most from the more familiar physical adjustments of the spine that characterize chiropractic care or are in need of more gentle massage in order to reduce discomfort, the Caron Chiropractic staff will help you identify the strategy that is right for you. Call 1-651-255-9999 to schedule an appointment. This entry was posted	on Tuesday, March 22nd, 2016 at 9:41 pm	and is filed under Chiropractic Treatments. You can follow any responses to this entry through the RSS 2.0 feed. You can leave a response, or trackback from your own site.